Admiralty announce sinking of the Grenville, 8 dead, 73 missing, presumed dead. The Russian 8th Army launches an attack against the Finnish forces of Group Talvela, without success. The Finnish 9th Division is transferred from Suomussalmi to Kuhmo. Communist newspaper, The Daily Worker is suppressed in Britain. The US informs the Soviet Union that the “moral embargo” imposed on it after its 1939 attack on Finland no longer applies. British and Australian forces breach the defenses at Tobruk. 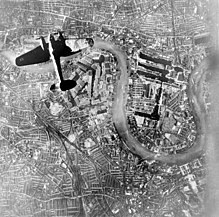 The Luftwaffe, with 400 aircraft available, begins a series of raids against London and ports in southern England. Without consulting higher authority, Rommel launches a counter-offensive against the 8th Army. The 21st Panzer Division quickly seizes Mersa Brega, while the 15th Panzer Division advances to Wadi Faregh and swings north towards Agedabia, brushing aside the attempts by the 1st Armoured Division to stop them. General Joseph W. Stillwell is appointed as Chief of Staff to Chiang Kai-shek. First Japanese bombing of New Guinea. The Combined Chiefs of Staff issue the Casablanca Directive. Its principal aim was to weld RAF and USAAF strategic bomber forces into one mighty air arm able to crush the German industrial, military and economic system. It was also decided that to defer the cross-channel invasion until 1944. The Russians claim the capture of the Caucasian railway town of Voroshilovskiy and say that 500,000 Germans have been killed and 200,000 captured in the last two months of fighting. The largest Luftwaffe raid on Britain for some time, with 90 planes being spotted over Southeast England during the ‘Little Blitz’. Mosquito night-fighters equipped with radar account for 129 of the 329 aircraft shot down during the 5 month Little Blitz. The RAF sends 648 bombers to Magdeburg, but loses 55 for just 4 Luftwaffe fighters. Tannenburg is taken by Red Army, but only after the Germans blow up the memorial. British forces enter Monywa, 60 miles to the West of Mandalay.